Ever since everyone started carrying phones around and texting their friends 20 hours a day, there’s been a steep rise in sidewalk collisions (probably). It’s not easy to see that light post coming up in front of you when there’s a screen permanently installed a few inches in front of your face. That is, until you install the Type n Walk app that lets you see where you’re going while you’re texting. The clever app uses your iPhone’s camera to give you a kind of x-ray vision while you’re walking along with your nose stuck to your screen. 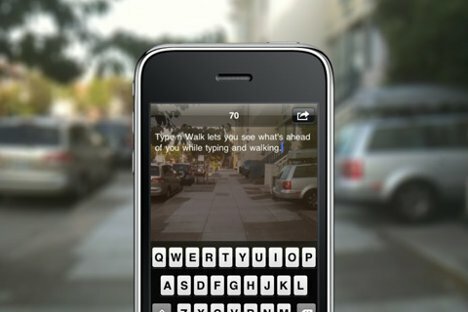 It makes your texting window transparent too, letting you see both the conversation and your surroundings…and maybe preventing some really painful concussions. It seems worth it for less than a dollar.